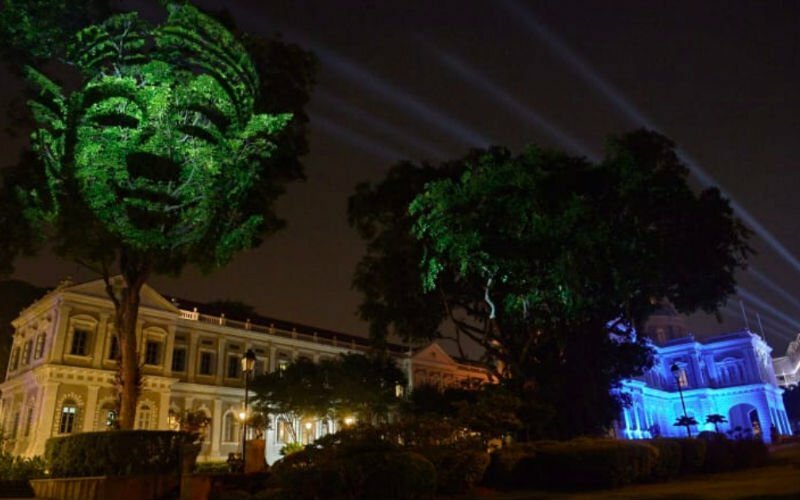 A projected visual art installation entitled Divine Trees by French artist Clement Briend was on display during the Singapore Night Festival in 2014. Singapore is preparing to launch the seventh edition of Singapore Art Week, a visual arts celebration that takes place in multiple neighbourhoods and venues, from the Civic District and Little India to other public and unconventional spaces around the city. Starting January 19, 2019, the event will unite art institutions, museums and galleries in bringing visual arts to a wider audience. In addition to art fairs, gallery openings and exhibitions, visitors will be able to enjoy public art, with site-specific installations spread over the Civic District, an art walk throughout Little India and an artist residency in an electronics mall, among other highlights this year. The National Gallery Singapore is behind the Light to Night Festival, an annual event that is stringing together two editions this year: the Singapore Art Week edition from January 18 to 27, followed by a second instalment marking the Singapore Bicentennial from January 28 to February 24. Over the course of the indoor/outdoor event, visitors will be able to tour public art commissions including “Arts Skins on Monuments” by Brandon Tay and Safuan Johari, a series of works appearing on the facades of the National Gallery and other venues, and Kaylene Tan and Ben Slater’s audio installation “Under the Five Trees” at Esplanade Park, which combines sound, music, poetry, narrative and landscape design to explore the area’s rich background. On January 25, the arts cluster Gillman Barracks will host its annual nighttime open house event Art After Dark, featuring pop-up stores, food and live music while spotlighting exhibitions by resident galleries. From January 18 to February 2, Artwalk Little India will welcome visitors to the vibrant cultural area to see murals, exhibitions and performances. Meanwhile, in the unlikely location of Sim Lim Square, Singapore’s electronic goods mall, a three-week residency will inhabit a store unit repurposed as an artist’s studio, bring together art and technology in guided tours, panel discussions and more. Among other highlights, Singapore-based artists will pay homage to the traditional art form of batik in an exhibition at the Malay Heritage Centre, while monsters from Asian horror films inspire a program of exhibitions and screenings offered as the Asian Film Archive’s 2019 edition of State of Motion. Singapore Art Week runs from January 19 to 27, 2019. Find details and a full program at www.artweek.sg.